Skip the blank page and go straight to brilliant with new integrated templates and more. Reach more clients with personal messages. Touching base with your customers is easier and harder than ever. With tons of channels to reach prospects, customers are over-stimulated with brand-generated content. Share authentic video testimonials to bring the personal touch back to selling cars. 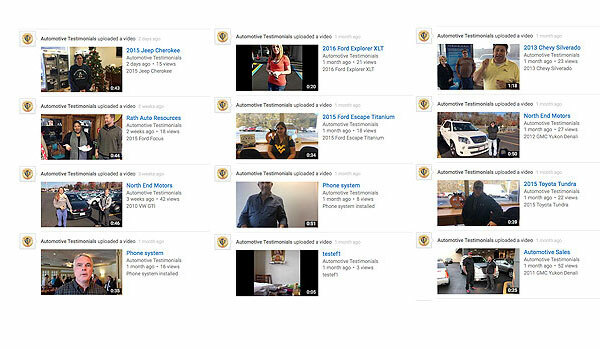 Create of "Video Library" of happy customers sharing their positive experience with your dealership. Prospects will recognize you as the dealership with all the good reviews. Start today when you download the Testimonial Builder app. Testimonial Builder is the innovative way to build your business by integrating online reputation, social media, video SEO, and website traffic generation all designed to increase sales. Search Engine giant Google owns YouTube, the second largest search engine, so video and online reputation now play one of the largest roles in Google's Ranking Algorithm. Testimonial Builder enables you to record a customer testimonial at the time of sale while they are excited and then promote the online video testimonial automatically. Using this service will also improve your online reputation (90% of consumers are influenced by online reviews) and earn new business in 4 easy steps: 1) Shoot Your Testimonial, 2) Share on Custom YouTube Channel, 3) Forward video to customer, customer shares on their Personal Social Media (the average person has 350 Facebook Friends), and 4) Build Your Brand. This is a marketing email from Testimonial Builder Click here to unsubscribe.